Wireless charging your iPhone X and iPhone 8 is only the beginning, as Apple just bought a small, but important wireless charging company today. ‎It now counts PowerbyProxi among the seven small firms it has bought so far in 2017, one that Samsung had invested $4 million (about £3m, AU$5m) into. Straight out of New Zealand and originally part of Auckland University, the team will join Apple "to create a wireless future," said Dan Riccio, Senior Vice President of Hardware Engineering at Apple, according to Stuff. "We want to bring truly effortless charging to more places and more customers around the world," said Riccio. What does 'a wireless future' mean? PowerbyProxi's expertise in this 'wireless future' undoubtedly will go beyond charging that big ol' iPhone 8 Plus without a soon-to-be archaic lightning cable. Apple is already planning to expand beyond the Qi standard its technology is based on with the AirPower. 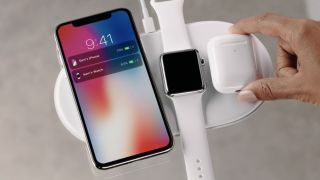 It can charge multiple devices at once, including the Apple Watch 3 and AirPods (with a new wireless case coming soon). AirPower is due in 2018 and the wireless AirPods case is rumored for December. But these hardly seem like the 'future' for the brains behind PowerbyProxi. Given it has a page on its website dedicated to autonomous charging for drones and unmanned vehicles, there may be a bigger investment here. Could we see wireless charging for cars, not just in cars for your phone? Or the often theorized true wireless charging from a foot away? The name PowerbyProxi, after all, is short for Power by Proximity. PowerbyProxi's patents and knowledge could play a bigger part in freeing us from both Lightning and charging pads in the distant future.